French President Emmanuel Macron said he defended the Iranian nuclear deal in front of US President Donald Trump, calling it a “good accord” that would be irresponsible to disrespect. Trump has repeatedly suggested he could pull the US from the deal. “Renouncing it would be a grave error, not respecting it would be irresponsible, because it is a good accord that is essential to peace at a time where the risk of an infernal conflagration cannot be excluded,” Macron said in his address at the UN General Assembly on Tuesday. The French leader stressed that he made this point to both Trump and Iranian President Hassan Rouhani, whom he met on Monday in New York. “Frankly, I don’t think you’ve heard the last of it,” the US President added. Trump labeled the Iranian authorities a “reckless regime,” which “masks a corrupt dictatorship behind the false guise of a democracy.” Iranian FM Mohammad Javad Zarif has since responded by calling Trump’s words “shameless and ignorant remarks” and accusing the US of ignoring Iran’s fight against terrorism while supporting “tyrannical regimes” in the region. Previously, Trump expressed his desire to demolish the Joint Comprehensive Plan of Action (JCPOA) on numerous occasions, promising that he would reach a final decision “very soon” on certifying before Congress whether or not Iran is abiding by the agreement. Last week, the International Atomic Energy Agency (IAEA) certified that Iran complied with the agreement. The nuclear deal was signed in 2015 after years of negotiations between Tehran and the P5+1 powers. The deal eased international sanctions on Iran in exchange for the country curbing its controversial nuclear program. According to JCPOA, Tehran was to eliminate its stockpile of medium-enriched uranium, almost entirely get rid of its stockpile of low-enriched uranium and cut a third of its gas centrifuges, among other measures. 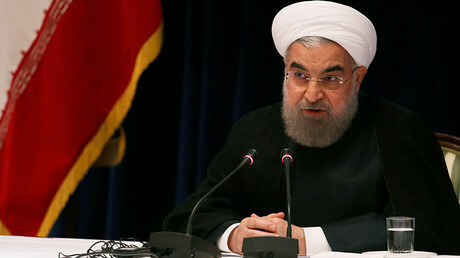 In his interview with the CNN ahead of UN General Assembly, Iranian president Rouhani warned Washington that quitting the deal “would carry a high cost” for the US. The move would “yield no results for the US, but at the same time it will generally decrease and cut away and chip away at international trust placed in the United States of America,” he said. If the Trump administration withdraws from the deal, the US will also face an appropriate response from Iran “probably within a week” as countermeasures are already prepared in Tehran, Rouhani declared.